Poverty can take on a life of its own. Most poverty situations can seem unbearable. Even the child of God can find themselves in a poverty situation that can seem unending. Notwithstanding the child of God has absolutely everything needed to prosper in life, if the child fails it is the child's fault, not God's. Children of God have been given "a measure of faith", but its up to us to develop our faith. Sometimes not fully understanding how faith works will lead us down the road to despair. The enemy would love to keep you thinking that you have no future. when actually the child of God has a very bright future. It is up to us to tap into it! 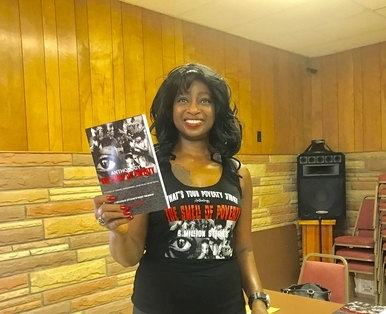 In my book The Smell Of Poverty, an Anthology, I along with 15 other Authors speak on different types of poverty. The one common goal is to remove yourself from any poverty situation, learn from it, pass the valuable information on and never return to a poverty situation again. (when a righteous person falls, they will get up again) All negatively is pushed to the forefront and negativity is a dream killer! a FAITHFUL child of God, who has gotten back up and has found her "awakening" I can help you take what is yours in the Kingdom. FULLY UNDERSTANDING YOUR GOD GIVEN WEALTH.